What comes to mind when you think of the Florida coast? Sandy beaches, sunshine, warm water and … toxic algal blooms? Algal blooms have become the unfortunate reality in Martin County, Fla. and other areas of the state, where they have caused rivers, and now beaches, to be closed to swimmers. Florida Gov. Rick Scott declared an emergency today because the water in the area, known locally as the “Treasure Coast,” is too polluted for swimming. 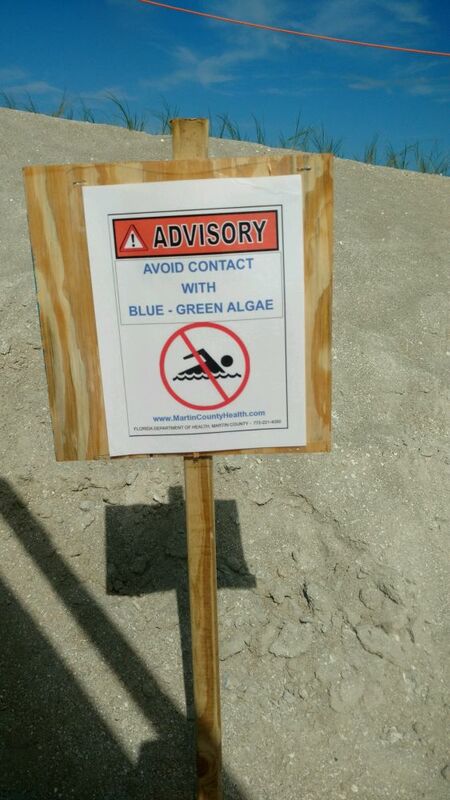 This is the first time beaches in Martin County have been closed due to algae. In a place that relies heavily upon the draw of the beach for tourism dollars, this is an alarming problem, especially as the Fourth of July weekend looms and crowds flock to the beach to celebrate. The appearance of this blue-green toxic blob is no natural phenomenon. As we have described before, toxic algal blooms develop when water is polluted with high levels of nutrients, like nitrates and phosphorous. For algal blooms in Martin County, Lake Erie and other parts of the country, the primary source of pollution is conventional agriculture. In the Florida case, polluted runoff from sugar cane farms and other agriculture operations flows into Lake Okeechobee, the largest freshwater lake in the state. When water levels of the lake rise too high and it risks flooding, state officials will flush waters from the lake into rivers, like the St. Lucie River that flows from the middle of the state into the ocean by passing through Martin County. Jenna Brown, a physical therapist (and, full disclosure, my sister), lives in Jensen Beach, one of the impacted areas. She has expressed anger and worry at the appearance of the algal bloom. The algae is toxic to aquatic life and to people. Brief exposure to cyanobacteria found in algal blooms can cause skin rashes, eye irritation and breathing problems. Contact with the bacteria at higher doses can even cause liver failure. “My husband is a member of Martin County Ocean Rescue and I worry about the health and safety of him and his coworkers,” Brown added. While the impacts of pollution from Big Ag may seem like a distant thought to most of us, the typically pristine beaches of the Treasure Coast covered in blue-green algae are a reminder that what happens on the farm doesn’t always stay on the farm.